This skull (above) was considered a non-aboriginal skull, in other words not a Native Person. Why was this non-native person sporting an elongated skull in Michigan at Copper Island? 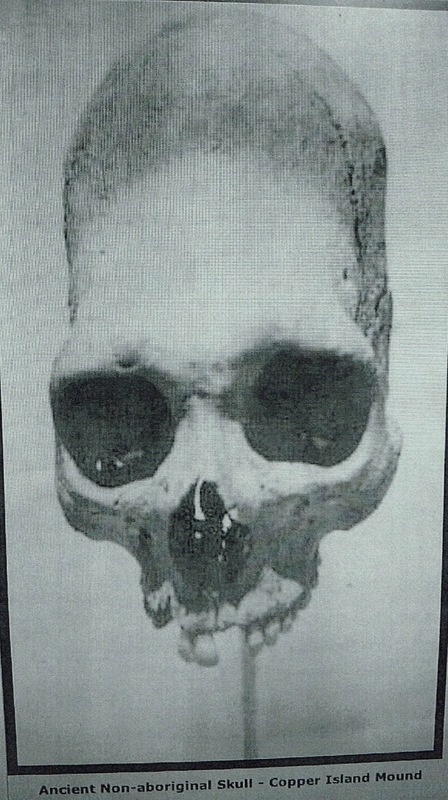 An elongated skull, not a Native, who has rather enormous eye sockets. This sounds a bit like the Cherokee tribes' description of the moon-eyed people. LINK: The Moon-Eyed people were first mentioned in a 1797 book by Benjamin Smith Barton. Later documentation tells of similar accounts, such as an 1823 book, The Natural and Aboriginal History of Tennessee, which tells of a band of white people who were killed or driven out of Kentucky and West Tennessee. These people were described as being there first when the Cherokee arrived in the area and also living in caverns and underground, preferring darkness and sensitive to light. Who was this elongated skull person? As incredible as this find was, we have yet to really hear a word on its history and happy parading by archaeologists to show off a find that puts history on its ear.